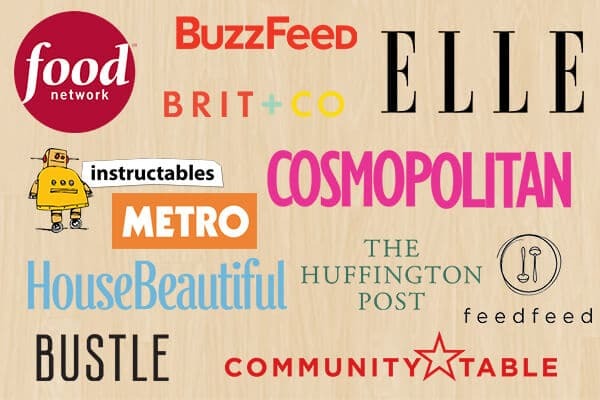 Welcome to January 2015! With the undisputed return of exercise regimes and healthy diets, it’s time to abandon the December gluttony & adopt the resolution dominated New Year. Honestly though? I think we’re all far too pressurized into being ‘healthy healthy’ in January and a lot of what we strive to achieve is, well, unrealistic to say the least. Personally I believe it’s easier to trick yourself by simply altering the hearty wintery foods we all love into healthier versions. That way, you’re more likely to stick to trying to eat better. The alternative? 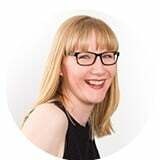 Eating a lettuce leaf for lunch then going home, giving in, and scoffing the entire kitchen! Be honest – we’ve all done it. So! Here’s what I propose you start with. 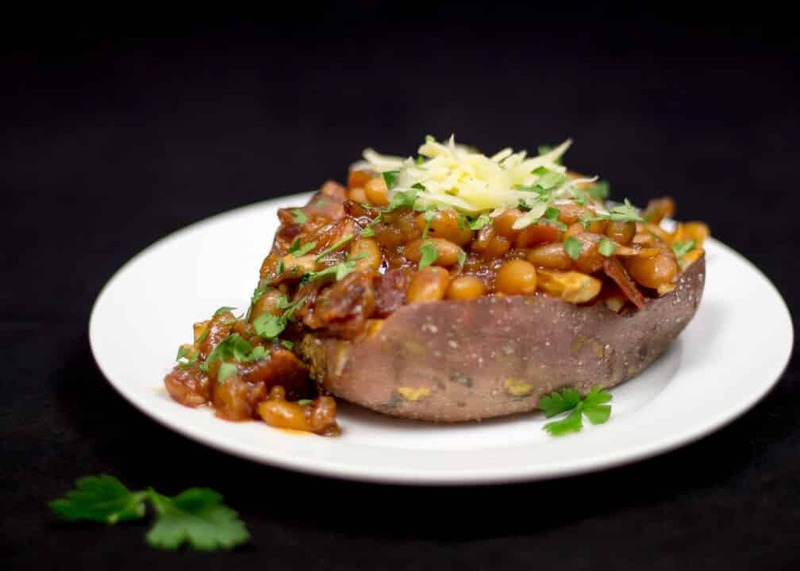 This sensational, baked sweet potato topped with Boston style baked beans. 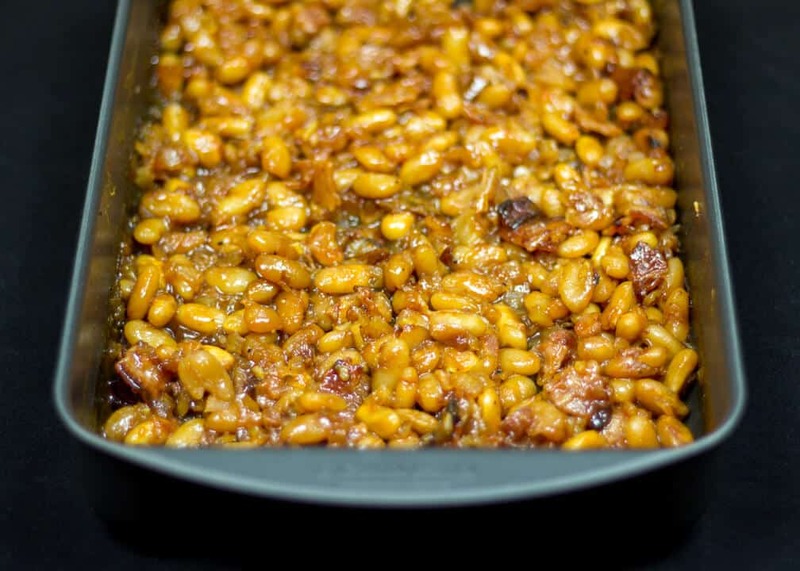 Trust me – these beans are FAR superior to any you can buy in a tin and are well worth a little extra time & effort! Another bonus? 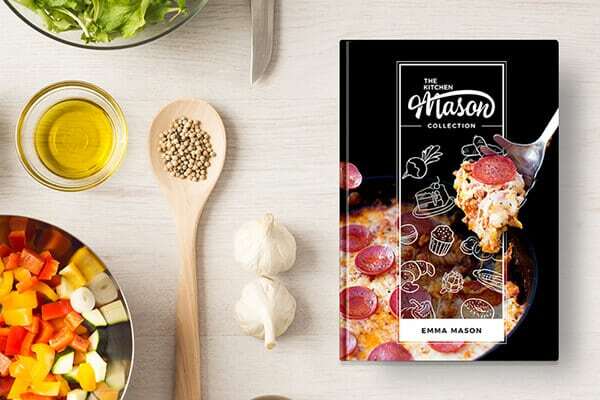 It’s naturally gluten free so a great, tasty dish for you coeliac sufferers too. After something a little different? Try this beautifully simple sweet potato curry recipe! Preheat your oven to 170°C/Fan 160°C. To make the beans, prep your ingredients. Chop up the bacon, finely dice the onions & crush the garlic. Preferably, use a large roasting pan that can also be used on the hob. Alternatively, just use a frying pan to start with and transfer to a roasting pan. Heat your chosen food vessel over a medium/high heat then add in the bacon and fry until browned. (About 5mins.) No need for any oil, the bacon will create it’s own fabulous juices. 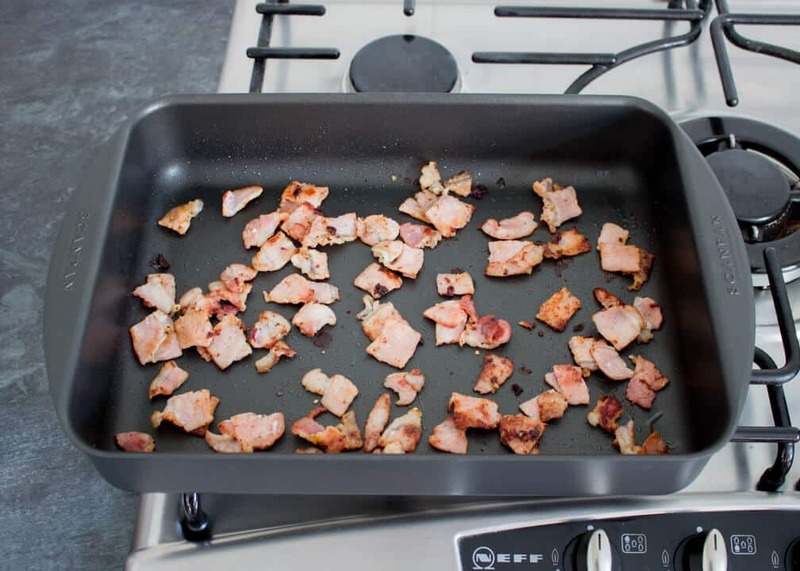 If you used a frying pan, transfer the bacon & juices into a roasting pan. 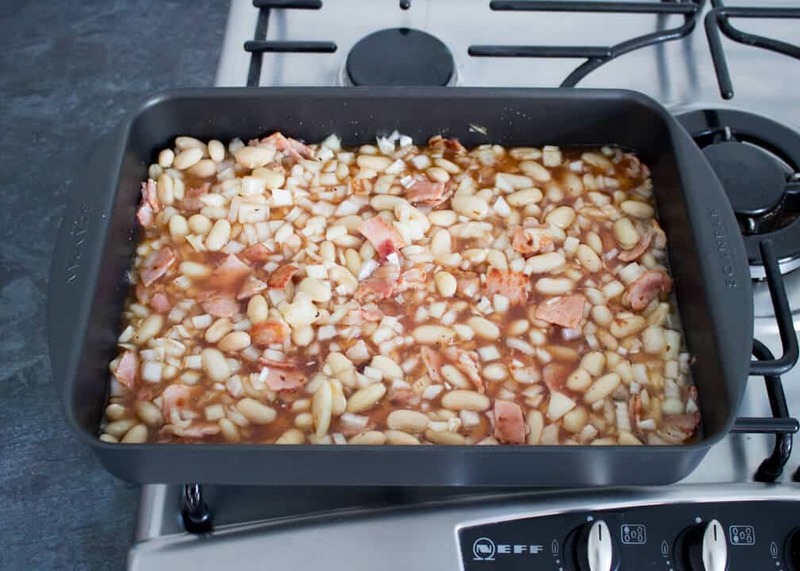 Add in the beans, (including the juices) the diced onion & the garlic and give it a stir. Put the rest of the ingredients (minus the fresh parsley) into a jug, stir, then tip it all into the roasting pan. Mix it all up then pop it in the lower part of your oven and bake uncovered for about 60-70mins until the sauce has reduced down to a beautiful sticky sauce & the beans are soft. These beans will keep in an airtight container in the fridge for 3-4 days if you wanted to make them in advance. Alternatively, keep covered to one side then simply reheat when your potatoes are ready. To bake the sweet potatoes, crank the oven up to 200°C/Fan 180°C. Rub the potatoes in a little olive oil & some salt. Place on a baking tray lined with foil & put into the centre of the preheated oven for approx 45 minutes. When done, the skin should be nice & crispy and the insides soft & smooth. When your baked sweet potato are cooked, slice them down the middle and, if you like, add a little grated cheddar cheese. Then top with a generous helping of the beans & sprinkle with some freshly chopped parsley to add a little freshness. Et vous voila! You got yourself a wholesome, hearty dinner that’s not only really good for you – but tastes incredible! 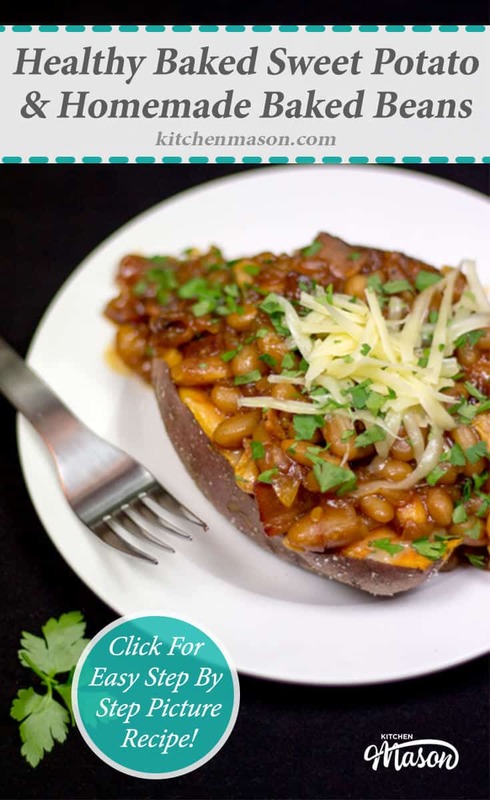 And it’s only a stones throw away from the regular jacket potato with cheese & beans that we all know and love. 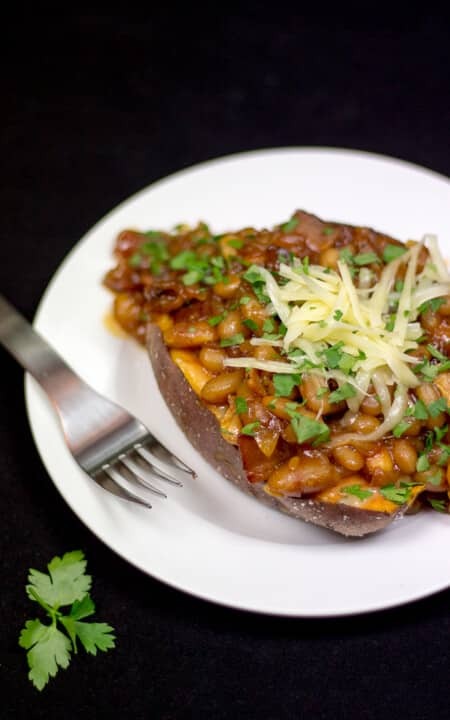 Seriously, you’ve got to give this Baked Sweet Potato & Beans a go. I promise it’s worth the extra bit of effort to make your own beans. It would be amazing if you could get these in a tin but, for now, I’m more than happy to make my own when they taste as good as this! I hope you enjoyed this week’s post my lovelies. Oh, and Happy New Year everyone! Until next time.